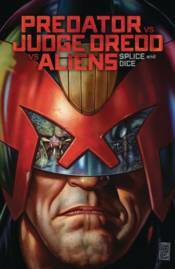 The ultimate science-fiction crossover pits the legendary lawman, Judge Dredd, against the universe's supreme hunters, the Predators, as they both try to survive an onslaught by the galaxy's ultimate killing machines, the Aliens! Judge Dredd and Judge Anderson have tracked a criminal cult across the Cursed Earth and into the Alabama morass, where a mad genetic scientist with destructive designs has acquired the best genes that evolution has to offer-a xenomorph skull! A Predator, attracted to the warm climate and superior prey, has declared hunting season as he calls for backup. All paths will cross in a mind-blowing scifi showdown with the fate of the Earth at stake! Collects the four-issue miniseries. o A co-publication with IDW and 2000 AD!